Happy Wednesday! 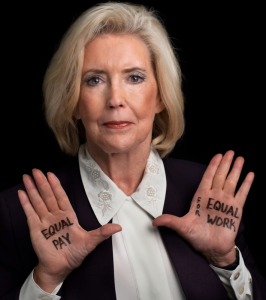 This week, we’re taking a closer look at Lilly Ledbetter! Ginsberg went on to say that the appropriate remedy to this injustice was to re-write the laws governing fair pay … and in 2009, President Barack Obama’s first act was to sign the Lilly Ledbetter Fair Pay Act. This law gave women standing to sue employers for gender-based pay inequity, which helped all American women … except Lilly Ledbetter, whose case preceded the law. Despite this (or perhaps because of it) Lilly has spent the last decade championing for women’s pay equity, and for gender equity in general. She has given scores of inspirational lectures at universities, conferences, and union conventions. Be sure to contact us for more information about hosting Lilly at your next event! Write inquiries@jodisolomonspeakers.com for more information. —And that is the story for this week! Be sure to follow us on Facebook and Twitter to keep up with the latest from all of our speakers, scientists and change makers!